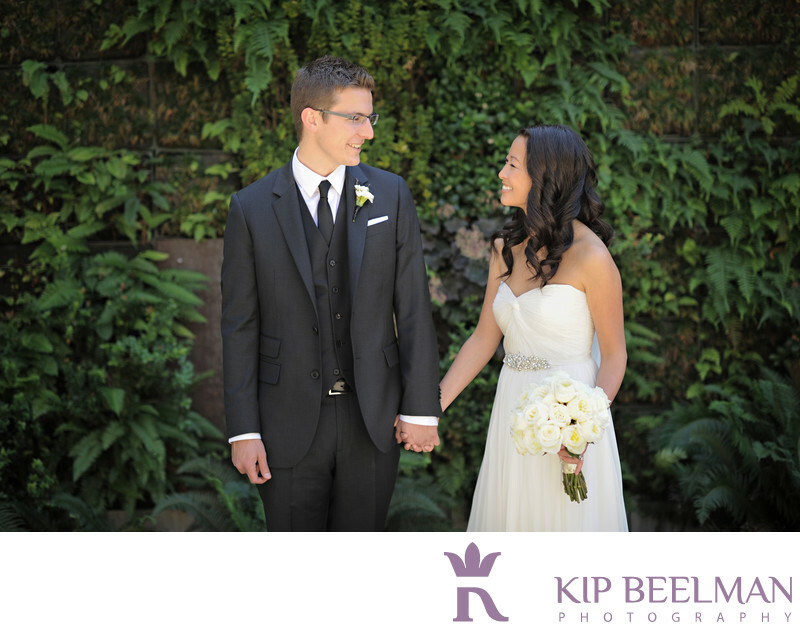 Pretty light, pretty couple, simple moment - A pretty wedding photograph. As you might be able to guess from the expressions on the couple’s faces, this initial wedding photograph was taken just after the bride and groom’s first look at each other on their wedding day in the courtyard of Hotel Modera. I think you can see that combination of delight and anticipation and the genuine pleasure of just being in the moment. The Hotel Modera was fantastic for getting ready and taking wedding portraits – this luxury boutique hotel in downtown Portland reflects the vibrancy of the city and the beauty of this particular couple with its sophisticated architecture and clean, sleek lines. An inspired urban escape, the inner courtyard projects a tranquil, elegant atmosphere amidst the busy city that really set the tone for the day and events to come. It is also home to Portland’s first Living Wall, a sustainable 63-foot by 15-foot living work of art that we were able to incorporate in the Hotel Moderna wedding photography. Also located in Portland, the Leftbank Annex wedding venue provided a raw, industrial feel of timber, concrete, brick and steel that offered a perfect juxtaposition to the soft, romantic and sweet elements of the day. We enjoyed amazing light, scenery and energy all day. Once a machine shop for World War II airplane parts, the space eventually evolved into a unique event venue that is fantastic for weddings and wedding photography. I absolutely loved this space (as did the couple, of course) – it is centrally located in Portland and offers incredible light and space. We took advantage of soaring beamed ceilings, fantastic windows, city views and naturescapes for additional wedding photographs and touching moments of connection. Location: 240 N Broadway, Portland, OR 97227. Keywords: Hall Wedding (21), Leftbank Annex (3), Portland (3).